Thelma Leggroan’s parents, Louis and Nettie James Leggroan, were born in the Salt Lake Valley. Louis grew up partly in Idaho and after he and Nettie married, they farmed near Idaho Falls. Thelma, their first child, was born in Bingham County, Idaho, at the end of 1903. A second daughter, Frances, was born three years later. In 1907, Louis and Nettie brought the girls to Mill Creek, Utah, where they once again took up farming near Nettie’s family home In 1911, tragedy struck when Nettie suddenly died while she was pregnant with the couple’s third child. Louis was left to raise his two young daughters alone. Fortunately, Mill Creek was full of relatives from the Leggroan and James families, so Louis had support until he met Alice Weaver and married her the following year. Alice Weaver Leggroan became a kind stepmother to Thelma and Frances. She and Louis adopted a son, Phillip, so the girls grew up with a brother. As children, Thelma and her little sister, Frances, developed a close bond and a lifelong friendship. Even after they were adults, they sometimes found that they had independently purchased the same piece of clothing and so dressed alike. Their father, Louis, watched out for his daughters and was very protective. When the girls attended school, boys from outside their immediate neighborhood teased them endlessly, so Louis taught them to stand up for themselves. That was easier for Frances, who found it natural to engage in confrontation. Thelma was more likely to turn away and run for cover. Utah’s schools were never segregated, so Thelma enjoyed the same quality of education as did her white neighbors. One of her school teachers, Ina Johnson, was an important mentor from whom Thelma learned life lessons and with whom she stayed acquainted long after she left school. Louis Leggroan cultivated fruit, grapes, and grew a variety of vegetables. The whole family helped with farm chores and the Leggroans relied on their children’s help during harvest time. Late in life, Thelma enjoyed eating fruit jam, but refused to eat fresh peaches, apricots or cherries. She told her son that she had picked so much fruit on the farm that she never wanted to see another peach! About 1925, a young man from Virginia came through Salt Lake City on his way to California. 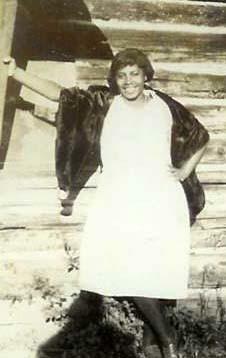 He became friends with Thelma’s brother-in-law, Monroe Fleming and through him, met Thelma. A year and a half after his arrival, Mack Duffy was still in Salt Lake. He found common labor jobs to support himself and finance a lengthy stay in the valley which gave him time to court Thelma. They married on September 7, 1927 and a year later left Utah for California. Except for a short period around 1930 when they moved back to Salt Lake, the Duffys made Los Angeles their home. Thelma’s life changed dramatically when she arrived in Southern California. Los Angeles was much larger and more diverse than Salt Lake had been. Her life in Mill Creek revolved around family. The black families who farmed there relied on each other for support and socializing. In contrast, there was a large African American community in Los Angeles with black owned businesses, black churches, and black social life. Thelma saw multiple new opportunities available to her. She had graduated from Granite High School in Salt Lake and so she enrolled in a trade technical college in California where she pursued business education. Thelma learned stenography, typing, and general office skills. She told her son years later that a new world opened up to her when she left the farm in Mill Creek. She had not realized how limited and isolated her life was in Utah until she left. In Los Angeles, Thelma found she could attend a black church where she felt she was an important part of the congregation. She knew she could have “a say” there. Maybe most importantly the black church offered a safe and welcoming place to its members. No matter what difficulties they faced in the larger world, black folks could be sure that at least at church they would find mutual respect and understanding. When asked by her son what her experience had been like in the LDS church in Utah, Thelma summed up what it was like to be a black Mormon by saying, “Well, we didn’t sing in the choir.” She had never felt she was at the center as a Mormon, but as a Baptist she could be. Her husband, Mack, had been raised as a Catholic, so the Duffys gave their son a dual religious experience. He served as an altar boy in the Catholic Church at 9:00 a.m. Sunday Mass and still made it to the 11:00 o’clock black Baptist worship service afterward. Mack and Thelma named their only child after his Mormon grandfather, Louis, and took him to visit his LDS family in Utah. Thelma also taught her son about the legacy of his Mormon ancestors and their religious devotion. She handed down to him, the map her great-grandmother, Jane Elizabeth Manning James, carried across the plains in 1847. Looking back on the things she had heard growing up about the LDS priesthood and temple restrictions—things like, “It’s not your time yet; maybe later”—Thelma recognized how psychologically damaging it had been to be taught as a child that her position in life was inferior to that of whites. Thelma and Mack lived the rest of their lives in Los Angeles. Mack died in 1957, but Thelma lived another forty years without him. She and her sister, Frances, remained close friends until they both died in 1997, just eight months apart. Thelma Leggroan and Mack Duffy are buried in Evergreen Memorial Park in Los Angeles, California, where Biddy Mason (a black slave brought west by her white Mormon masters) is also buried. Department of Health and Welfare. State Birth Index. Thelma Leggroan. Certificate of Birth. Certificate no. D83-0164. Idaho Bureau of Vital Records and Health Statistics. Boise, Idaho. Duffy, Louis. Telephone interview by Tonya S. Reiter. 28 April 2018. Notes in possession of author. “Leggroan.” Presiding Bishopric stake and mission census, 1914-1925. CR 4 311. Church History Library, Church of Jesus Christ of Latter-day Saints, Salt Lake City, Utah. Louis Leggroan and Alice Rayford, Utah, Marriages, 1887-1966. Salt Lake City, Utah. Microfilm number 429,080. Family History Library, Salt Lake City, Utah. State of California Department of Health Services. California Death Index, 1940-1997. Thelma Leggroan Duffy. Certificate of Death. Social Security Number 569244701. Center for Health Statistics. Sacramento, California. United States. 1940 Census. California, Los Angeles, Los Angeles. United States, State of California. Mrs.Thelma Duffy. Great Register of Voters, 1900-1968. California State Library, Sacramento, California. Department of Health and Welfare. State Birth Index. Thelma Leggroan, Certificate of Birth, certificate no. D83-0164, Idaho Bureau of Vital Records and Health Statistics, Boise, Idaho. United States, 1910 Census, Utah, Salt Lake County, Wilford (Mill Creek). Louis Leggroan and Alice Rayford, Utah, Marriages, 1887-1966. Salt Lake City, Utah. Family History Library, Salt Lake City, Utah. microfilm number 429,080. Louis Duffy, son of Thelma Leggroan Duffy, telephone interview by Tonya S. Reiter, 28 April 2018, notes in possession of author. Unless otherwise noted, this interview is the source for this biography of Thelma L. Duffy. Louis Duffy still has his mother’s Beehive necklace. Louis Duffy generously donated that map to the Salt Lake Genesis Group of the Church of Jesus Christ of Latter-day Saints. Louis Duffy, telephone interview, 28 April 2018.